Book review: Paola Scarrone, Angela Stefanutto, Manuale del Puncetto Colorato (Società Operaia di Mutuo Soccorso di Varallo, 2006), 72 pages. €23, available from Italian Needlecrafts. 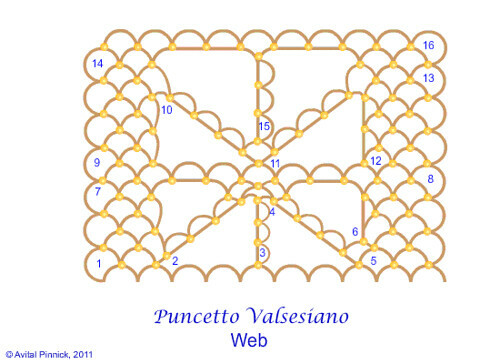 Puncetto Valsesiano needle lace is currently enjoying a revival. Its simplicity of construction — a single knot, created with a needle and thread — and its elegant designs have contributed to its popularity. The familiar all-white Puncetto is characteristic of the Valsesia region, located in Piedmont, northern Italy, near the borders of France and Switzerland. Its lesser-known variation, coloured puncetto, is primarily from the Mastallone valley, an area north of the Valsesia river. Coloured Puncetto is a prominent feature of women’s costumes of Sabbia, Cravagliana, Fobello, Cervatto, and Rimella. A panel of needle lace runs vertically down the center of the bodice and the stylized apron. On either side of the lace panel, the fabric is gathered with smocking worked in the same pattern and colours as the lace. Sometimes narrow embroidered floral designs are worked beside the lace panel. According to the authors of this book, different colours were used for different occasions, such as work, wedding, baptism, mourning. Red is suitable for young women and for weddings, blue for older women, blue and purple for half-mourning, and black for full mourning. In the past, coloured puncetto was worked with silk threads, but silk has largely been replaced by perle cotton, which is more readily available. 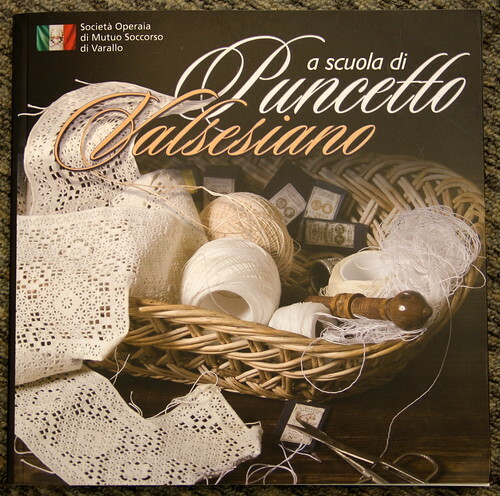 This book builds on the basic tutorials and motifs provided in A Scuola di Puncetto Valsesiano although, interestingly, it was published three years before Scuola. Its format and diagrams are very similar. Most coloured puncetto designs are based on the stelle miste (mixed “star” or square) design, characterized by the corners being worked horizontally and the center, diagonally. The book is written in Italian. Because it relies on the information provided in Scuola, I recommend that you use both books together. The diagrams are very clear, but you will need a good understanding of the structure of the motifs in order to follow the graphs. 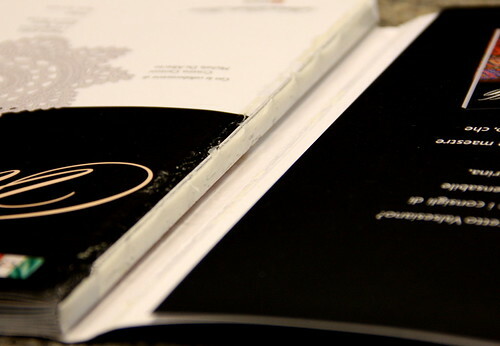 The book is organized into two parts. 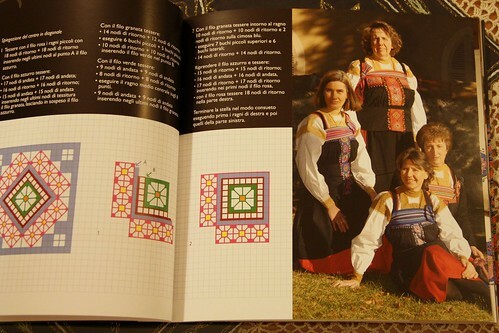 The first part provides step-by-step diagrams of motifs (as in the photo above, with the four women), while the second half provides only finished diagrams (see the photo above with the close-up of the embroidery). If you are comfortable with the techniques described in the first book, you should have no difficulty following the patterns in the second book. The binding seems to be of better quality than Scuola; I haven’t had any problems with the cover coming loose. The photos are extremely sharp, which makes it easy to count stitches and to duplicate designs whose patterns are not included. The diagonally worked sections tend to stretch more than you would expect, so make sure that your diagonal spiders (ragni) are quite dainty. It’s generally good practice to make a loop a little smaller than you think it should be. 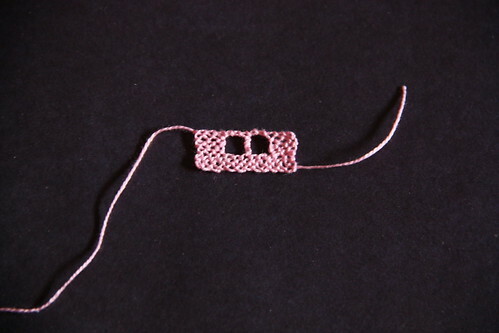 A too-short loop can be stretched into shape but a too-long loop looks sloppy and is impossible to cover with stitches. Use an extra needle for coloured puncetto. It won’t eliminate the tedium of threading/unthreading needles for the contrasting spider centers but it will reduce some of the the threading because you can keep a needle threaded with the main colour of the spider. When you join a new thread, do not cut the ends of the threads close to the work until you are well past that area, especially if you need to work stitches into that area later (for example, joining corners of the center to the stitches around the edge). It is very frustrating to have a loop suddenly come undone because you cut the thread ends. 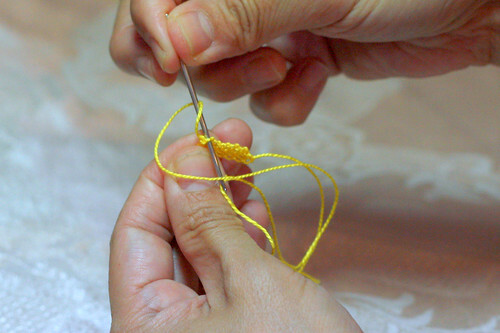 Tightening a knot puts a lot of pressure on the loop into which you are working the stitch, and if the ends are cut short, they will slip out of place. 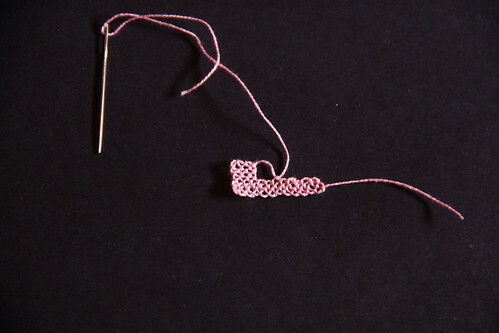 After every row, hold the motif in the air and let the needle dangle free to untwist the thread. 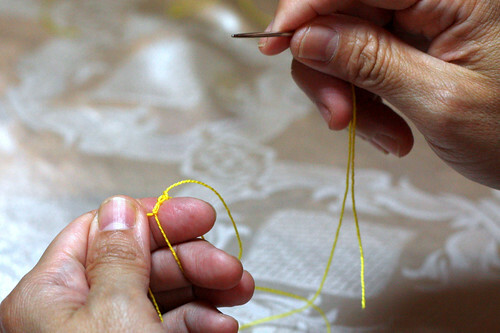 Because you are working hundreds of single knots, the thread will become more tightly twisted with each stitch. Try to keep the tail threaded through the needle fairly short (no more than about 6 inches) if you are using thread that tends to snarl. While you will have to pull more thread through each stitch, it will cut down on the knots caused by the tail thread getting caught in the main thread. Those tend to be the hardest (for me) to unpick. Keep a sharp pin handy to unpick knots if you make a mistake. If you’ve made a big mistake, cut the section off with sharp embroidery scissors. You don’t need to start all over again constructing a new base. 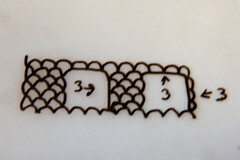 The new joined thread is easily hidden by working stitches over it, so try to salvage as much of your work as possible. If you finish and you discover a mistake, see whether you can fix it by working more stitches with a needle and thread. Puncetto is so dense that a few stitches added to a row will never be noticed in the finished piece. 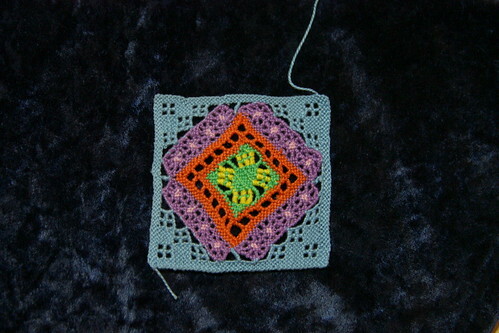 The photo below is a typical example of a stelle miste design with DMC Cordonnet 30 and a size 26 tapestry needle. Here are a couple examples of coloured puncetto squares that I worked from the book with perle 8 cotton and a size 26 tapestry needle. My eyesight isn’t what it used to be, so I’m always trying to find short-cuts. I’ve started working some of the larger coloured Puncetto motifs from the book Manuale del Puncetto colorato. (One of these days I will write a review!) Because counting the loops on the side of the base is extremely tedious, I use a marker thread to mark every tenth loop. It takes no extra time to work the edge stitch around the thread and it makes counting a lot easier. Puncetto Valsesiano, an Italian needle lace, has captivated many with its elegant, austere designs and apparent simplicity. The only materials required are a needle and thread. 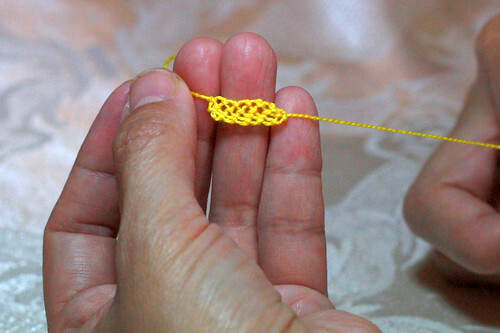 The lace is created entirely with a simple overhand knot, made by looping the thread around the needle. 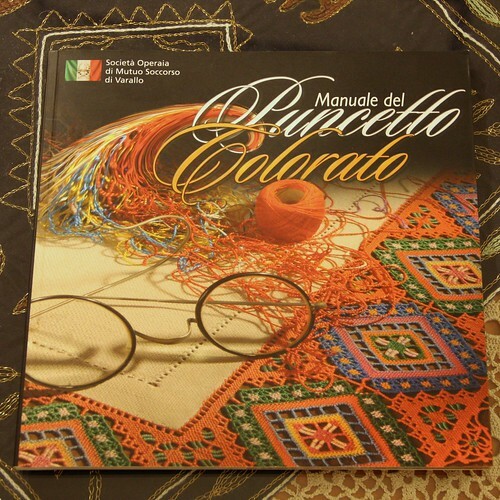 Unfortunately, there is very little information about Puncetto in English, apart from the Anchor Manual of Needlework and Gentle Arts. You are probably wondering whether this book be used by someone who doesn’t read Italian. The answer is “Yes,” as long as you are comfortable with schematic diagrams (like the charts in Burda crochet magazines) and enjoy solving puzzles. These diagrams are comprehensible without knowing Italian (I’m currently working on a short glossary to translate terms found in this book, which may make some things easier). Each small red square represents a single stitch, 2 rows. 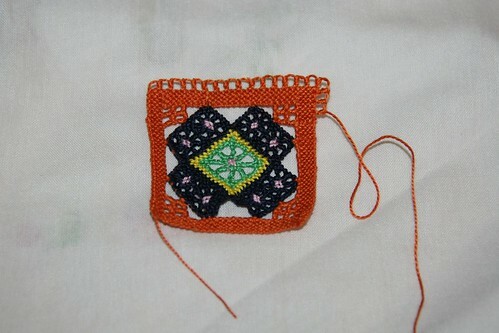 The blue square represents 2 stitches, 4 rows, and so on. When you skip a single stitch, the small vertical red line may look like a knot, but it is actually a loop; you are skipping one loop or two knots. An important point to keep in mind is that the diagrams are a graphical shorthand for describing the Puncetto motifs. They are not exact depictions, in the way that filet crochet or cross-stitch charts are. Because successive rows of stitches are offset, like bricks in a wall, they cannot be shown on a grid. 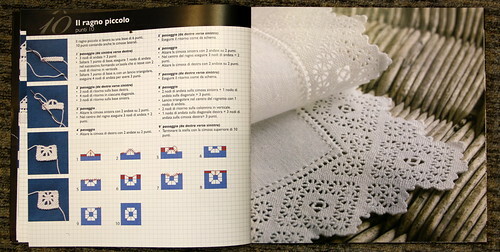 I recommend that you practice the simpler motifs, such as blocks, spiders, etc., before you tackle the more advanced design because if you do not have a good grasp of the structure of the basic motif, you will run into trouble (usually too many or not enough stitches when you finish a row). This book provides a rich variety of motifs and edgings, far more than I’ve seen in any other source. There are “stars” (“stars” are actually the small square motifs that form the basis for strips and doilies), corners, edgings, scallops, picots, circular motifs, triangles, diagonally worked corners, and doily centers — even leaves, much like the leaves of bobbin lace. The basic knot is briefly described with photos. In theory, a beginner could use this book and develop a large repertoire of motifs. The only materials required are a needle and cotton thread, usually size 30, but sometimes size 80-100 is used, with correspondingly fine needles. The sample page above contains a fairly typical lesson, with a motif on the left side and a gorgeous finished piece on the right. Before you get too excited, you should know that this is not a pattern book. 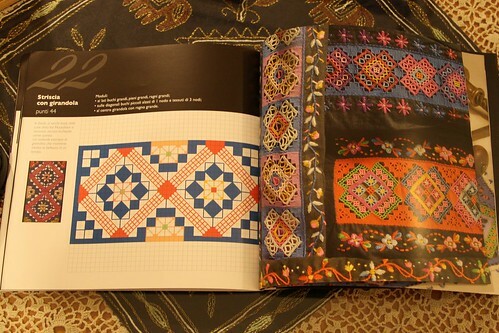 For example, the wide edging with corner on the right page is not accompanied by an actual pattern. 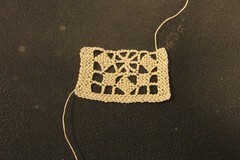 However, if the pattern is not too complicated, you should be able to duplicate it if you master the basic motifs. That’s the beauty of Puncetto — once you’ve mastered the basics, it’s fairly easy to copy patterns from photographs. The photos of Puncetto that appear on dark blue backgrounds (left page in the photo above) are the only ones accompanied by instructions. I made one of the motifs, #12, “Ragni piccoli uniti,” and found the chart to be accurate. DMC Cebelia 30 with a size 26 tapestry needle worked very well. Sometimes the coloured squares appear to be out of sync with the grid. The reason for this is that the grid of grey lines is based on two stitches; a single, small square is two stitches wide and two stitches high. 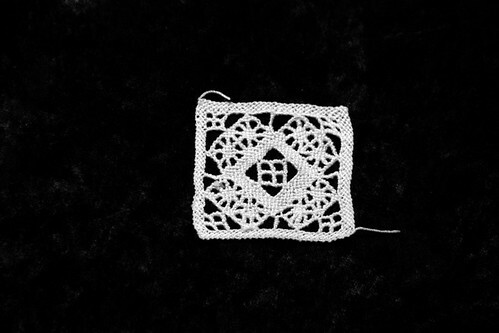 Patterns based on three stitches look strange when superimposed on the grey grid (for example, the two large squares of #20, Stelle con rosette piccole ed autin), but the stitch count seems to be accurate. Each square or stella has a label indicating the size of the base you need to work (for example, Punti 46). The quality of the book is generally very high. The paper is heavy, the colour reproduction is good, the diagrams are clear, and the photos are beautifully styled, lit, and sharp enough to count the stitches. The weakest part of the book is the binding. I handled my book fairly gently but the cover is starting to fall off. It’s not a deal-breaker because the signatures are sewn and the cover can be glued later if necessary, but one expects a soft-cover book of this price to keep its cover longer than a week. It’s probably best to photocopy a working copy of a pattern rather than leaving the book open. Despite these shortcomings, I highly recommend this book. testa di morto Death’s Head (X in a space), now often called Cat’s Paw, because it sounds nicer. The books that I ordered on Puncetto Valsesiano (basic and coloured Puncetto) have arrived! I will try to post reviews. I’m also working on a spreadsheet of Italian words with English translations that may help you if you own these books. I just need to track down a couple more terms and read them through a few times. No, I don’t read Italian, but I can read French and Latin and Italian is not a difficult language. The Google translation site is a very useful resource! For some reason, people seem find the diamond a tricky design. I think it’s because if you don’t realise that the rows are worked diagonally, you might be tempted to work back and forth horizontally, increasing at each side, then decreasing on each side. That would give anyone hives. Fortunately, the diamond is not all that difficult, especially when you see the thread path in the animation that follows. The sample is worked on 10 loops (= 11 knots). The actual number is irrelevant because the diamond itself occupies a space that is 2 squares wide and 2 squares high. I am using a 3-knot square as my base, so this diamond covers 6 loops (= 7 knots). L to R: Make 2 knots in 2 loops. R to L: Make 2 knots in 2 loops. Repeat. L to R: Make 2 knots in 2 loops. This forms the lower left block of the sample. Skip 2 loops of the base row of loops and make a knot in the the 3rd loop, leaving enough thread to form the diagonal side of the triangular space on the lower left side of the diamond. Skip 2 loops of the base row and make a knot in the 3rd loop, leaving enough thread to form the diagonal side and the right vertical side of the triangular space on the lower right side of the diamond. You are read to start the lower right block of the sample. L to R: Make 2 knots in 2 loops. 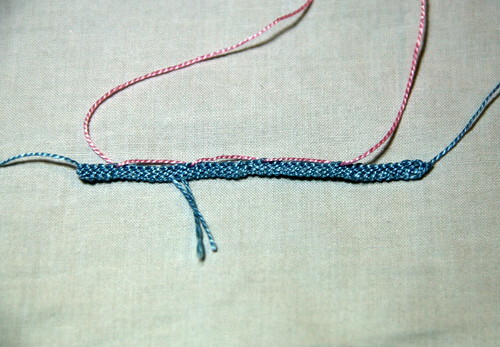 R to L: Make 2 knots in 2 loops and 1 knot on the vertical thread. Repeat. L to R: Make 2 knots in 2 loops. This forms the lower right block of the sample. R to L: Make 2 knots in 2 loops. Start working the diamond. 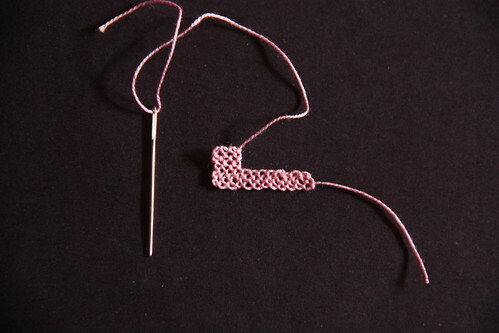 R to L: Make 5 knots on the right diagonal thread and 1 knot on the left diagonal thread. L to R: Make 4 knots in 4 loops. R to L: Make 4 knots in 4 loops and 1 knot on the left diagonal thread. Repeat the last two rows 3 times. You have finished the diamond. Continuing R to L: Make 2 knots on 2 loops (over top of the lower left block). Start the upper left block. L to R: Make 2 knots in 2 loops. R to L: Make 2 knots in 2 loops. Repeat. L to R: Make 2 knots in 2 loops. This forms the upper left block of the sample. Make a knot in the top loop of the diamond, leaving enough thread to form the top edge of the triangular space on the upper left side of the diamond. 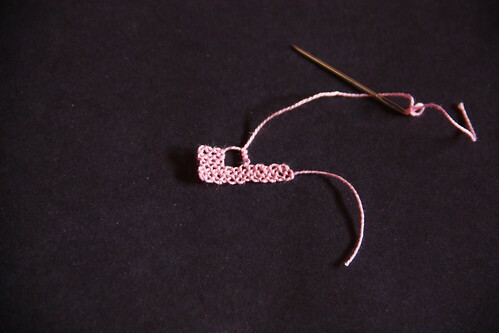 Make a knot on the first loop of the lower right block, leaving enough thread to form the top edge and right side of the triangular space on the upper right side of the diamond. Work the upper right block: L to R: Make 2 knots in 2 loops. R to L: Make 2 knots in 2 loops and 1 knot on the vertical thread. Repeat. L to R: Make 2 knots in 2 loops. R to L: Make 2 knots in 2 loops. Make 3 knots on the thread over the right triangular space. 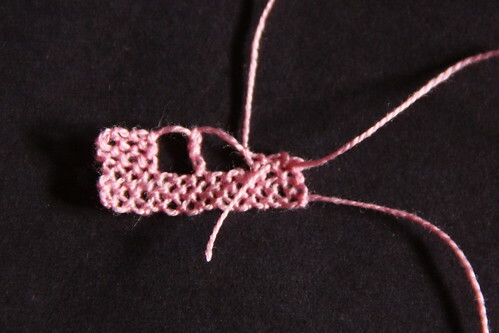 Make 3 knots on the thread over the left triangular space. Make 2 knots in 2 loops (over top of upper right block). 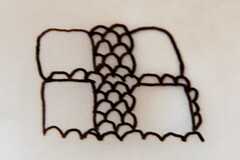 The Web pattern is a fairly common filling stitch with many variations. I’m getting faster at working with Flash but this animation took longer than I expected. It had so many frames (over 800 hand-drawn keyframes!) that my computer began to slow down. This sample is worked on a base of 11 knots (10 loops) but the base doesn’t matter because the web itself is two squares high and two squares wide. You can work a web between vertical bars, solid squares, and as a filling, as shown in the drawing above. Abbreviations: L to R (Working from left to right); R to L (working from right to left). Remember that the work is not turned. L to R: Make 2 knots on 2 loops. 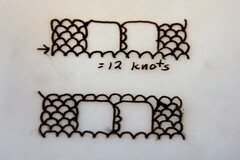 L to R: Skip 2 loops and make a knot in the third loop, leaving enough thread to form a diagonal side and an upright side of the left triangular space. Working upwards, make 3 knots on the loop you just formed. L to R: Skip 2 loops and make a knot in the third loop, leaving enough thread to form a diagonal side of the second triangular space. L to R: Make 2 knots in the last 2 loops of the row. R to L: Make 2 knots in the two loops you just formed. R to L: Make 4 knots on the first diagonal thread. Make 4 knots on the second diagonal thread and 2 knots in the loops. L to R: Make 2 knots in 2 loops. R toL: Make 2 knots in two loops. L to R: Make 2 knots in 2 loops, leave a space of thread to form the horizontal bar of a triangular space and make a knot in the top loop of the left diagonal thread. Make a knot in the loop between the diagonal threads. 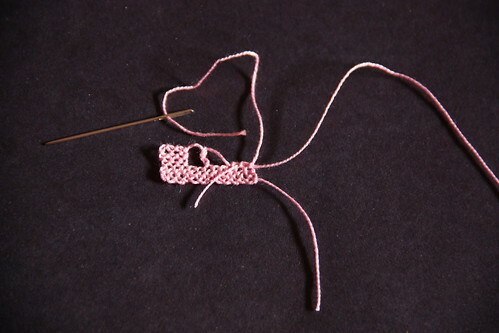 Make a knot in the top loop of the right diagonal thread. Leave a space of thread and make a knot in the loop just beside the number “6”. L to R: Make 2 knots in the next 2 loops. R to L: Make 2 knots in 2 loops. L to R: Make 2 knots in 2 loops. R to L: Make 2 knots in 2 loops, 2 knots on the horizontal thread over the right triangular space, 2 knots in 2 loops, 2 knots on the horizontal thread over the left triangular space, and 2 knots in two loops. L to R: Make 2 knots in two loops. R to L: Make 2 knots in 2 loops. Repeat these 2 rows. 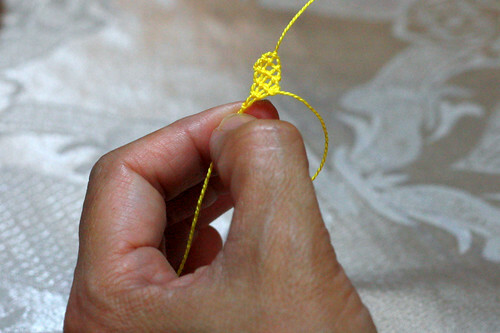 Leave enough thread to form the diagonal of a triangular space, skip 2 loops and make a knot in the center loop. Leave enough thread to form the diagonal and the upright bar of a triangular space, skip 2 loops and make a knot in the third loop. L to R: Make 2 knots in 2 loops. R to L: Make 2 knots in 2 loops. Repeat these 2 rows. L to R: Make 2 knots in 2 loops. R to L: Make 2 knots in 2 loops, 4 knots on the diagonal thread of the right triangular space, 4 knots on the diagonal thread of the left triangular space, and 2 knots in 2 loops. L to R: Make 2 knots on two loops, leave enough thread to form the horizontal bar and upright bar of a triangular space, and make a knot in the central loop of the row below. Working upwards, make 3 knots on the upright bar between the triangular spaces. Leave enough thread to form the upright of a triangular space and make a knot in the top loop of the right diagonal thread. Make 2 knots in 2 loops. R to L: Make knots in all the loops. It’s taken an unconscionable length of time to write this post. I had to figure out how to do squares and bars again. I also decided that it would be useful to devise a way to diagram the stitches because it’s very hard to see stitches in a photograph. 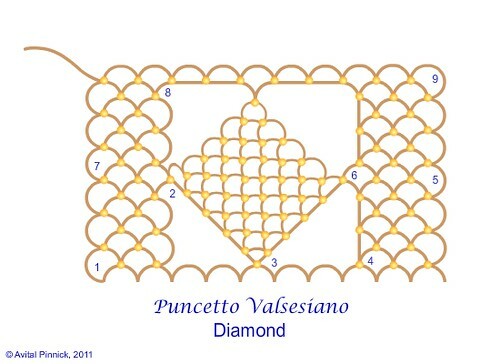 This tutorial is about the squares and bars (both vertical and horizontal) that form the foundation of Puncetto lace. I will cover diamonds and webs (spiders) in a later tutorial! The diagram below is a fairly typical simple Puncetto design. I used it as the basis of my tiny motif a couple years ago. 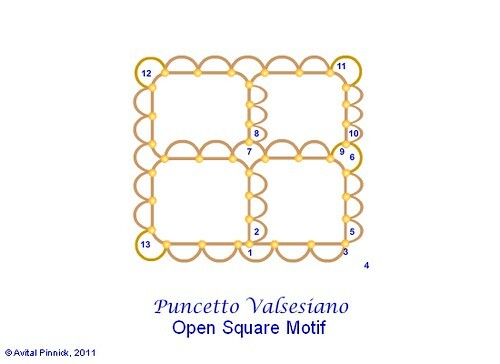 Puncetto Valsesiano designs are based on a grid of squares that can vary in size from 2 knots to 4 knots (for the sake of clarity, I am going to use the word “knots” instead of “stitches”). A grid of 3 knots is the most common variation and that is the size that I am using throughout these tutorials. 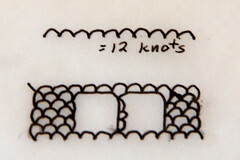 My sample is based on a ladder foundation of 12 knots. Count very carefully! If you make a mistake in the number of knots, you will have to start over. The photos of this tutorial are followed by drawings. Please excuse the messiness. My main computer is getting repaired and upgraded, so I don’t have access to fancy drawing tools on this loaner laptop. 1. Starting from the left end of your ladder foundation, work 3 knots in the first three loops. You will be working from left to right. Without turning your work, work 3 knots in the 3 spaces you have just made, working from right to left. Repeat these two rows. Work another left-to-right row, so that your thread is at the right side of the block you have just made. 2. 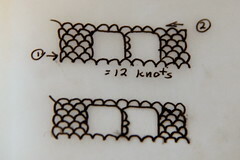 To form an empty space, skip 3 knots (= 2 loops) and work a knot in the third loop, leaving enough thread for the top and side of the empty space. 3. To make a vertical bar, work 3 knots on the thread loop you have just made. Remember: If you are working on a 3×3 knot grid, vertical and horizontal bars will have 3 knots on them. 4. Skip 3 knots (= 2 loops) and work a knot in the third loop, again leaving enough thread for the top and side of the empty square. This photo also shows how to join a new thread, which is described below. Work 2 knots in the next two loops. 5. This part is a little tricky because it seems counter-intuitive, but this is how you make a square after an empty space. 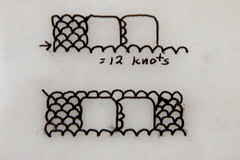 Working from right to left, make a knot in each of the 2 loops and a knot on the thread forming the left side of the square (= 3 knots, working right to left). 6. Working from left to right, make 2 knots in the 2 loops. This seems odd to be working 3 knots/2 knots/3 knots/2 knots, but trust me. Squares surrounded by empty spaces are worked this way. 7. Now you’re ready to work the final right-to-left row over the entire sample. Make a knot in the 2 loops of the square, make 3 knots in the first horizontal bar, make 3 knots in the second horizontal bar, and make 3 knots in the last 3 loops. Including the starting point of your thread (= knot) and the 11 knots you just worked, you will have 12 knots total in this row. 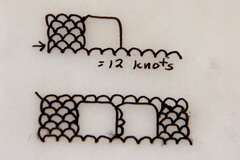 The drawings below show the working of the same sample. There is one mistake: I actually drew 11 knots and didn’t realise it until I had to draw the final square. That shows you how important it is to count your knots! 1. Start with a ladder foundation of 12 knots. 2. The arrow indicates where you start the first square. Work 3 knots in 3 spaces. Repeat 5 times. Skip 3 knots (2 loops) and work a knot. 3. The vertical bar has 3 knots. Skip another 3 knots and work a knot. 4. Work 2 knots in the next 2 loops to form the first row of the square. Working from right to left, work 2 knots in 2 loops and the third knot on the vertical thread that forms the left side of the square. Working from left to right, work 2 knots in the 2 loops (remember — only 2 knots!). 5. When the square is complete, work the final right-to-left row (“2” in the drawing): 2 knots in 2 spaces, 3 knots on horizontal bar, 3 knots on horizontal bar, and 3 knots on 3 loops. This diagram shows that upright bars have 3 knots on them, whether they are vertical bars or sides of squares. Horizontal bars also have 3 knots. This diagram shows how to place a square over an empty space. 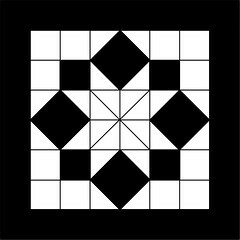 Your instincts will tell you to start in the loop spanning the square and space in the row below, but if you do that, the square will not be aligned properly over the space! 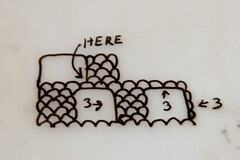 The arrow marked “HERE” points to the correct loop for beginning a square over a space. A square over a square is more straightforward. There should be 3 loops over the square. Work 3 knots in the 3 loops. 1. When joining a new thread, work a couple knots over the new thread with the old thread. 2. Drop the old thread. 3. Work a couple knots over the old thread with the new thread. You will have some doubled thread loops. Treat these as ordinary loops, working knots in the loops. 4. Cut the thread ends close to the loop. The ladder foundation is easier for beginners and less fiddly than the foundation thread. It is suitable for square and rectangular motifs. 1. 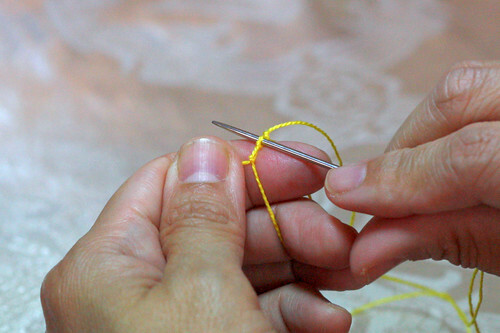 Using the circular thread foundation, make 3 stitches (or knots) on the thread. This is your first row (left-to-right). 2. Working from right to left, insert the needle in the first loop, wrap the thread around the needle, and make a stitch in each loop. 3. Work back and forth on these two loops until you have a ladder. 4. When the ladder has as many rows as you need stitches for the width of your motif, turn the ladder 90 degrees and work the next row of stitches on the side of the ladder. Remember not to flip the work over. The front of the ladder is always facing you. The first row worked down the side is a left-to-right row.